Teaser: A Columbia-led team has discovered a new method to manipulate the electrical conductivity of this game-changing material, the strongest known to man with applications ranging from nano-electronic devices to clean energy. 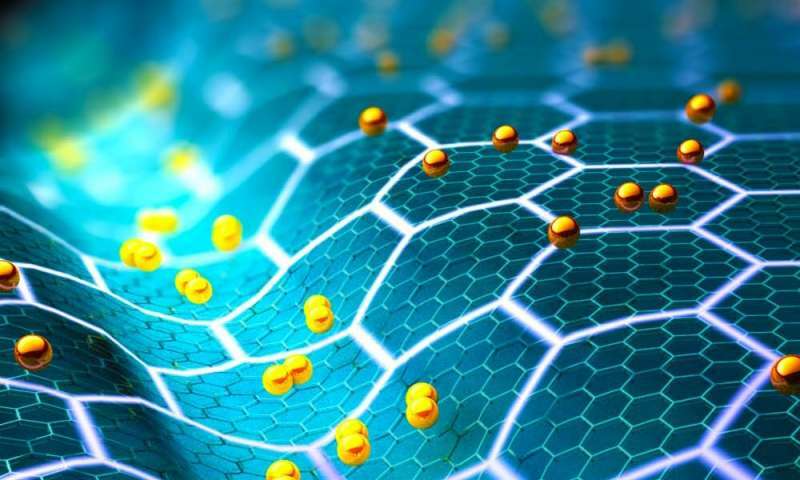 Graphene has been heralded as a wonder material. Not only is it the strongest, thinnest material ever discovered, its exceptional ability to conduct heat and electricity paves the way for innovation in areas ranging from electronics to energy to medicine. Now, a Columbia University-led team has developed a new method to finely tune adjacent layers of graphene—lacy, honeycomb-like sheets of carbon atoms—to induce superconductivity. Their research provides new insights into the physics underlying this two-dimensional material's intriguing characteristics. The team's paper is published in the Jan. 24 issue of Science. "Our work demonstrates new ways to induce superconductivity in twisted bilayer graphene, in particular, achieved by applying pressure," said Cory Dean, assistant professor of physics at Columbia and the study's principal investigator. "It also provides critical first confirmation of last year's MIT results—that bilayer graphene can exhibit electronic properties when twisted at an angle—and furthers our understanding of the system, which is extremely important for this new field of research." In March 2018 researchers at the Massachusetts Institute of Technology reported a groundbreaking discovery that two graphene layers can conduct electricity without resistance when the twist angle between them is 1.1 degrees, referred to as the "magic angle." But hitting that magic angle has proven difficult. "The layers must be twisted to within roughly a tenth of a degree around 1.1, which is experimentally challenging," Dean said. "We found that very small errors in alignment could give entirely different results." "Rather than trying to precisely control the angle, we asked whether we could instead vary the spacing between the layers," said Matthew Yankowitz, a postdoctoral research scientist in Columbia's physics department and first author on the study. "In this way any twist angle could, in principle, be turned into a magic angle." They studied a sample with twist angle of 1.3 degrees—only slightly larger than the magic angle but still far enough away to preclude superconductivity. Applying pressure transformed the material from a metal into either an insulator—in which electricity cannot flow—or a superconductor—where electrical current can pass without resistance—depending on the number of electrons in the material. "Remarkably, by applying pressure of over 10,000 atmospheres we observe the emergence of the insulating and superconducting phases," Dean said. Additionally, the superconductivity develops at the highest temperature observed in graphene so far, just over 3 degrees above absolute zero." To reach the high pressures needed to induce superconductivity the team worked closely with the National High Magnetic Field user facility, known as the Maglab, in Tallahassee, Florida. "This effort was a huge technical challenge," said Dean. "After fabricating one of most unique devices we've ever worked with, we then had to combine cryogenic temperatures, high magnetic fields, and high pressure—all while measuring electrical response. Putting this all together was a daunting task and our ability to make it work is really a tribute to the fantastic expertise at the Maglab." Andrea Young, assistant professor of physics at UC Santa Barbara, a collaborator on the study, said the work clearly demonstrates that squeezing the layers has same effect as twisting them and offers an alternative paradigm for manipulating the electronic properties in graphene. "Our findings significantly relax the constraints that make it challenging to study the system and gives us new knobs to control it," Young said. Dean and Young are now twisting and squeezing a variety of atomically-thin materials in the hopes of finding superconductivity emerging in other two-dimensional systems. "Understanding 'why' any of this is happening is a formidable challenge but critical for eventually harnessing the power of this material—and our work starts unraveling the mystery,'" Dean said.